(a) What is the electric field at the centre of the ring? Justify your answer. (i) What is the electric potential at the centre of the ring? (ii) If the charge placed on the ring is negative, will there be any change in the electric potential at the centre of the ring? Justify your answer. (c) Derive an expression for the electric potential at a point such as P on the axis of the positively charged ring. (Assume that the axis of the ring is along the x-direction and the centre of the ring is at the origin). (i)Using the expression for the electric potential obtained in part (c) above, obtain an expression for the electric field at the point P on the axis of the ring. 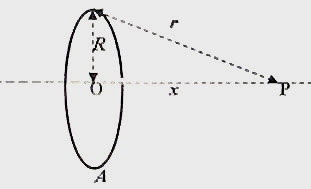 (e) Show qualitatively, in a diagram, the nature of variation of the electric field along the axis of the ring, covering both sides of the ring. (a) The electric field at the centre of the ring is zero. This follows from the definition of the electric field: Electric field at any point is the force per unit positive test charge placed at the point. The test charge placed at the centre of the ring will be repelled equally by the uniformly distributed positive charges on the conducting ring so that the net force on the test charge will be zero. [Note that the charge Q placed at the position A on the conducting ring will be uniformly distributed immediately throughout the ring]. (i) The charges on the ring are at the same distance R from the centre of the ring and hence the potential at the centre of the ring is Q/4πε0R. (ii) If the charge placed on the ring is negative, the potential will be negative. The potential in this case will be – Q/4πε0R. V = ∫dV = ∫dQ/4πε0r = Q/4πε0r (since all charge elements are at the same distance r from the point P). 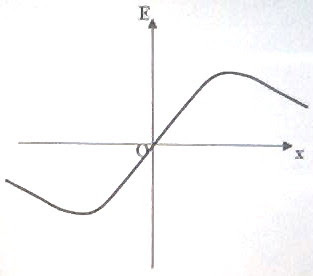 (d) The electric field at P due to an element dQ of charge at a point such as A is directed along AP. This field can be resolved into two components: one component along the axis of the ring (axial component) and the other component perpendicular to the axis of the ring (normal component). For every elemental charge at any given point on the ring, there is an equal elemental charge situated diametrically opposite to it. The diametrically opposite element will produce an equal axial component of field in the same direction. But the normal component due to the diametrically opposite elemental charge will be equal in magnitude but opposite in direction. Therefore, all axial components get added where as all normal components get canceled. The electric field due to the charged conducting ring is therefore directed along the axis of the ring. Since the charge on the ring is positive, the field E is along the positive x-direction. Or, 3x2 = R2+x2 from which x = R/√2. 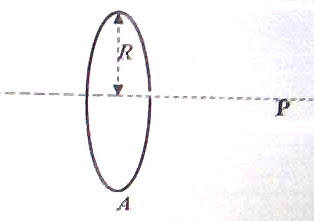 (e) The nature of variation of the electric field along the axis of the ring is shown in the adjoining figure in which O represents the centre of the ring. The field has maximum magnitude at points distant R/√2 from the centre and these are located symmetrically on either side of the centre. Positive direction of the field is the positive x-direction even though it is represented by positive y-plot in the figure. The negative direction of the field is the negative x-direction and is represented by negative y-plot in the figure. You can access all posts related to electrostatics (including multiple choice practice questions) on this site by clicking on the label ‘electrostatics’ below this post.